Replaceable dust filters protect the UPS in harsh environments. Optional SNMP Card When you purchase the SNMP card, you can monitor and manage UPS status remotely through the UPS Web interface or through EcoStruxure IT's cloud-based and on-premise software suites. 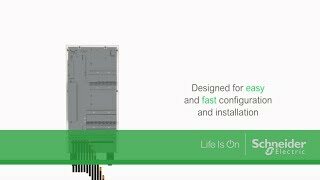 Click here for more information about EcoStruxure IT. Wide Input Voltage Window Saves your battery power for when you really need it - during power cuts! Straightforward installation Including the input, output, and bypass breakers, as well as the Emergency Power Off (EPO) switch, simplifies installation planning and speeds up deployment. Easy to install fast Quickly roll the compact and lightweight UPS into position. Easy Loop Test Verifies UPS performance before you connect your load, without the need for a load bank. Intuitive user interface The intuitive graphical user interface allows for easy system configuration.